This is an excellent free Premium WordPress theme. Whenever a web designer is creating a website, they must consider the type of theme they apply. A theme says a lot about a website and this is a fact.There are themes that are suitable for a certain niche and other themes are universal themes. All you have to do is select the theme that looks good on your website. 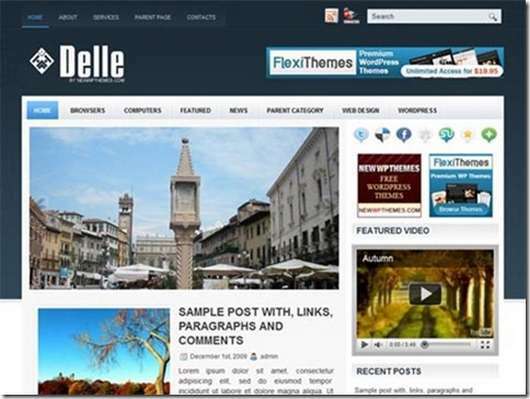 Delle is a free WordPress theme with many features. This theme offers content options and it supports any post thumbnails. This theme is the best for news or magazine websites. However, this does not mean that you cannot use it on other niche. This theme has great themes that will help the web designers in not only making their websites to look good and attractive, but also on other aspects such as SEO. Below are some of the features that you will get with this theme. The theme is incredible. Having a free version of theme that has the above features is very incredible. If you want to get the most out of your website, then this theme is for you.Moreover, the theme is attractive and you are guaranteed that you will be praised for that. The best thing about this theme is that it has an inn-builtGoogle analytics, with a highly customizable template option page.